Object counters or product counters are important applications used in industries, shopping malls, etc. They count objects or products automatically and so reduce human efforts. In this tutorial we are going to design a simple object counter circuit without using any microcontroller. The circuit diagram of object counter is quite similar to my previous project (digital stopwatch circuit) but a little complex . In this circuit we have used a comparator (IC LM358) and IR transmitter and receiver pair for detecting a object. 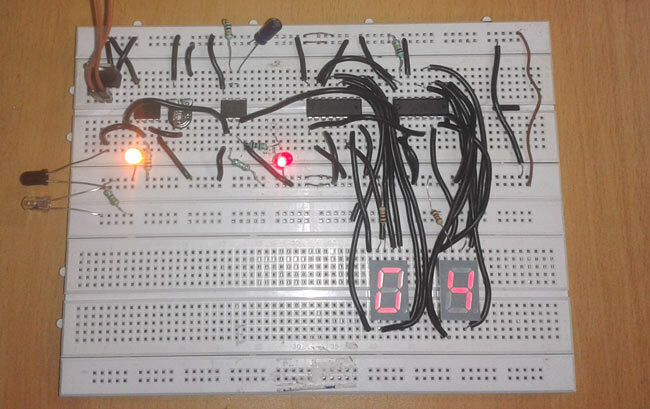 And then we have used a 555 timer IC to generate a pulse for triggering the seven segment decoder (CD4033) and two common cathode seven segment display units are connected with 7 segment decoder IC. 555 timer IC is configured in mono-stable mode for generating pulse. A LM7805 Voltage regulator is used for providing constant 5 volt power supply for the circuit. And a 9 volt battery used for powering the whole circuit. After getting a pulse from 555 timer we applied this to clock pin of 7 segment decoder (U4) and then carry out signal (pin 5) to clock pin of another 7segment decoder (U3). After getting pulse from 555 timer 7 segment counter changes number value of segment display. and when number counting reaches at 10 in U4 decoder then it sends carry out signal or pulse to seconds 7segment decoder (U3) and then second display changes his number value. And this process repeats again. This object counter circuit can count 00-99.